More than 85,000 U.S. companies were involved in war-related production during WWII. From bullet casings to tanks and airplanes, these organizations manufactured millions of tons of materiel. Less than five percent of the companies received the Army-Navy E Award for Excellence in Production. 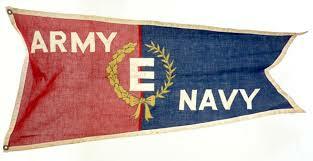 Also known as the Production Award, the E Award was the result of merging three awards: the Navy E award created in 1906 during Theodore Roosevelt's presidency, the Army A award, and the Army-Navy Munitions Star award. 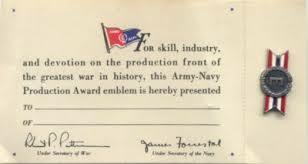 The awards remained separated until mid-1942 when the War Department decided to create a single, service-wide award. District procurement officers would recommend facilities, and an award board would review the recommendation and determine of the organization was award-worthy. 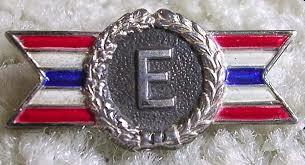 The company was given a pennant, and each employee received a silver lapel pin. Even now ore than seventy years later, U.S. manufacturing companies such as Hershey's, Westinghouse, Ford, and Jeep are proud of their awards and include the information in the history section of their website.